The LGI heart smear campaign continues? I wrote a week ago about the apparent ‘dirty fight‘ that is being conducted to achieve the closure of the children’s heart surgery unit at Leeds General Infirmary (LGI), highlighting some of the very suspicious aspects of the way surgery at the unit was suspended the day after pro-LGI campaigners won a key legal decision against the decision to close it. A couple of days ago, I disclosed that the draft ‘Rapid Response Team’ report (which may or may not be released next week) looks set to call LGI’s unit ‘fully exonerated’ and ‘world class’ – in complete contrast to the leaked smears suggesting that its death rate was double the national average. Leeds General Infirmary came “very close” to the “alert” threshold. While the strict facts of the article are correct, the thrust of it is clearly intended to indicate that there are problems at Leeds, even when a section of the report says there are not. However, the problems with the NICOR (National Institute for Cardiovascular Outcomes Research) report do not end with the way that it’s being covered by the media. The report itself, while trying to maintain a veneer of balance, contains elements that give serious cause for concern – not about the performance of LGI’s unit, but about the objectivity of the report. c) It was clear to the NICOR Steering Group that there were major deficiencies in the data submitted by Leeds (as exemplified by Table B). This has been addressed as actively as possible in the intervening period, as part of NICOR’s process to optimize data quality. d) The new data included in the current analysis of 07/04/13 is the reason for the difference in the outcomes for individual Trusts from the preliminary data. The effectiveness of the data submission process could be considered as a measure of organizational culture and commitment to quality service delivery. In other words, NICOR concludes that Leeds’ ‘failure’ to submit complete data in time is a sign of a lack of organisational competence and commitment to offering a good service. A statistical data team can claim competence in the analysis of data. But it is way outside the brief and competence of such team to reach conclusions about the motivations for the dates and extent of a data submission. Moreover, the Leeds team has made it perfectly clear that it did not submit its data specifically because it was flawed – which in no way suggests any lack of commitment or quality. For such a section even to be included in this report casts severe doubt on its objectivity and reliability – because it betrays a desire to cast a unit in a bad light that the data do not support. Even more worrying is something that casts doubt on the reliability of the data, the analytical process and the way in which it is portrayed. The report shows graphs of ‘standardised’ mortality plots for the 10 English children’s heart units for each of 3 years – 2009-10, 2010-11 and 2011-12 – and then one for the 3-year period as a whole. But the graph for the total – which is the basis for the claim that LGI was ‘very close to the alert threshold‘ makes no sense. To understand why it makes no sense, look at the graph below. For this graph I’ve superimposed the positions of LGI in each of the 3 years onto one graph, so you can see them together, and I’ve removed the plots for all the other heart units to remove any distraction. There appear to be only two plots for LGI, but that’s because the plots for two of the years fall in exactly the same position. 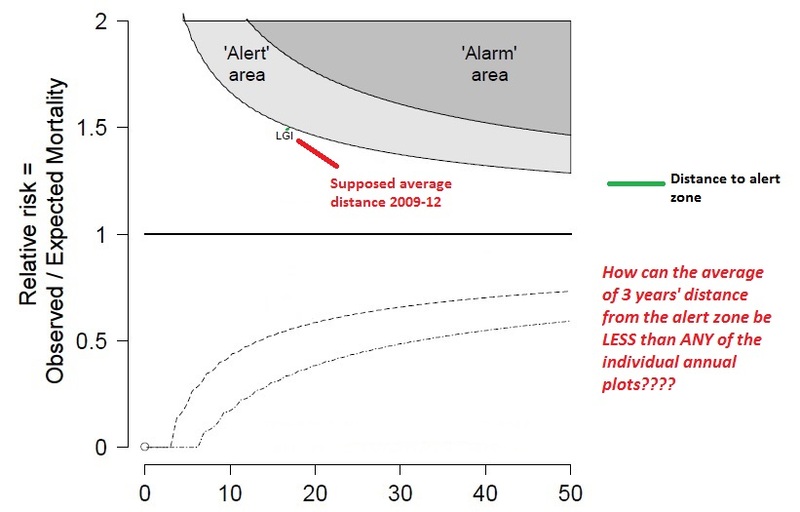 The green lines in the chart show the distance of each plot from the ‘alert’ zone – 2 years with a big distance, one year with a shorter distance. The green line for the distance to the alert zone is so small that it’s almost invisible. If you take an average of 3 things, you add all 3 together and divide by 3. The average of two equally long lines and a shorter line will be a line that is shorter than the two long lines but longer than the shortest one – and nearer to the length of the two long lines, because there are two of them and only one shorter one. It cannot be shorter than all of them. Or do it numerically. If two identical lines are 4cm long and a 3rd is 2cm long, their total length is 10cm. Divide by 3 and the average line length is 3.33333cm – nearer to 4cm than to 2cm. NICOR would have us believe that the average of 3 years, in none of which LGI gets very close to the ‘alert’ line, is very close to the alert line. It makes no sense and doesn’t stand up to scrutiny. NICOR has released the graphs, but has not released the methodology for the ‘standardisation’ adjustments it makes to the ‘raw’ mortality data. But whatever those adjustments are, if they can take 3 years’ distances and average them to a distance smaller than any of them, there is something seriously amiss with their methodology – and with their results. Edit: Professor David Spiegelhalter, the statistical advisor for the report, tells me via Twitter that the radically different position is a statistical effect because the greater number of results when the 3-year period is looked at as a whole means less uncertainty. The funnel shape arises because Units to the left of the plot are smaller and so we would expect more variability due to chance. 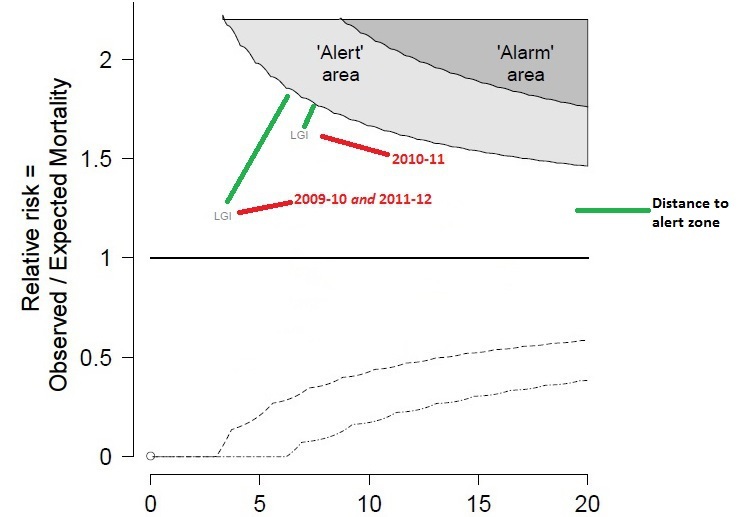 You’ll notice that LGI’s plot is much further to the left than either of the other ‘close to alert’ units. So any result within the funnel is not statistically significant anyway – and Leeds’ result is far more uncertain than the two units it was grouped with in the report and the surrounding publicity. Moreover, NICOR have not released the methodology of their calculations – the statistical weightings and adjustments applied to the raw data – and appear to be unwilling to do so. Since there is always an element of subjectivity and ‘(hopefully) educated guesswork’ in such statistical adjustments, the failure to offer these for public scrutiny also places a significant question-mark above the results. Yet none of this critial nuance was included in the media reports, nor in the unprofessional statement to the media by Roger Boyle (who has advocated LGI’s closure and can hardly be considered an impartial witness). You wouldn’t want to do that..
“We find they’re just on the edge of what we call an alert – in other words, showing that they were right on the edge of acceptability,” he told the BBC. show a significantly increased mortality rate. 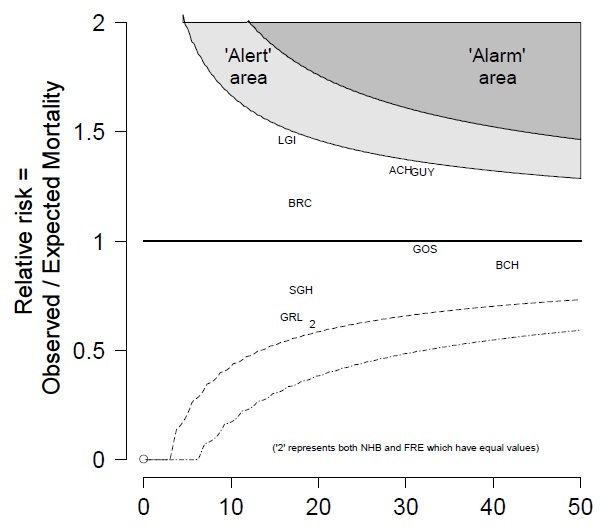 Any plot within the ‘funnel’ does not have a statistically significant higher mortality rate, even if it is near the ‘alert’ line. But Leeds is nowhere near the alert line anyway – until it somehow miraculously cosies up to that line in that strange 3-year plot. The NICOR report admits, as I have already shown with reference to the overall hospital mortality statistics that were supposed to show Mid Staffs to have high mortality, that there are serious drawbacks with any ‘average’ depiction of performance, because half of the units measured are always going to appear ‘worse’ than average. Skewed reporting, misleadingly-presented statistics, a report that goes way beyond its competence to make unfounded judgments about motives, and a public statement by someone who works for NICOR (and has consistently wanted Leeds closed) that doesn’t match NICOR’s own report on the same day. All in complete contradiction of the conclusions of the ‘Rapid Response Team’ who actually inspected the unit and considered it ‘fully exonerated’ and ‘world class’ – a report whose findings were leaked to me by a source very close to events in Leeds, but which may not be officially released to influence public opinion. Some people might consider that LGI is being set up to take a fall by vested interests who are determined to see it close no matter what. At the very least, there are serious concerns – and serious questions need to be asked about the provenance, methodology and motivations of an evidently-skewed set of data and conclusions. ← Mid Staffs ‘callousness’ – from a ‘patients’ campaigner’? I think you’re right to keep on about this. It has a very nasty ‘smell’ about it & I wouldn’t trust the statements made by Sir Bruce Keogh. I would love to know why the public are being subjected to incorrect information mainly due to biased, misleading reports & incompetent journalists who parrot the line given to them without investigating the facts beneath the story. The public need to know the real reason behind Keogh & NHS Englands desire to close the LGI & divert patients to Newcastle. The real reason will be something along the lines of “big is better, safer, cheaper (for the NHS, not for the patients and relatives but that’s a different (hopefully their) budget” – alas wrong on all 3 counts. IE Public maladministration. PS: In 2009 she represented all national heart charities for CHD on S&S Panel! (Note the majority of patients are treated in London who responded to this). There is a vocal minority who, because they live close to the surgical unit where their child has been treated and are concerned that that unit will close, do not support the changes. As they, too, have already given their views on the standards, I will not repeat the detail of their response. It is important that these views are heard and considered, and it is also important that they are not given inappropriate weighting. Most parents accept that to achieve high quality surgical outcomes involves consolidating surgery into fewer, higher volume units with the consequence that some families will have to travel further for surgery. The campaigns at Southampton and Leeds have highlighted the need for the final configuration decision to reflect accurate, natural patient flows from all parts of a hospital’s catchment, bearing in mind that parents may always opt to take their child to a treating centre that is not their nearest unit and taking account of the quality of the local transport infrastructure, impact of severe weather conditions and local rates of population growth or decline. We are persuaded that the patient flow modelling that underpins the review has generally been high and are also glad that additional modelling has been undertaken in key postcode areas because it is important to demonstrate that the process has been fair, accurate and not ‘fudged’ or ‘fixed’. We appreciate that for macro political reasons, the overall clinical need and configuration for Scotland was not included in the review. If the clinical outcomes rationale of teams of at least four surgeons performing at least 400 operations applies in England, we would expect the same logic to apply in Scotland. We anticipate that applying that rationale would have a knock-on effect for English centres, particularly the Freeman Hospital in Newcastle and would urge the JCPCT to make their decision mindful of the potential impact of changes to the configuration in Scotland. While we support the implementation of the Safe and Sustainable standards, CHF is neither aligned with any particular unit nor supporting any particular configuration option. As a national charity working on behalf of all children with CHD, it has not been appropriate for us to back any campaign in favour of a particular unit. Some of our member groups are supporting a particular option and have responded separately, in detail, to the consultation (for example Little Hearts Matter and Wessex Children’s Heart Circle support Option B); other groups (for example HeartLine Association and Downs Heart Group) have not expressed support for a particular option but wish to see standards improved across the heart care network, in line with the campaigning activity of many years, other groups (like South West Children’s Heart Circle which highlights the good practice at Bristol or the Children’s Heart Unit Fund which promotes the work of the Freeman Hospital) are supporting the service provided by the unit with which they have particular links and support improvement across the whole network. Many parents have a strong loyalty to the unit where their child has been treated and so will support the option that they feel gives that the unit the best chance of continuing to offer surgery. CHF respects the views of those parents and their right to express them. At the same time, we believe that it is vital that the decision regarding the reconfiguration should be based on the creation of a national service with clear managed networks rather than the continuation of the present regionally-based surgical services with ad hoc referral pathways.HF understands the loyalty parents feel towards their unit and supports the right of every hospital-linked group to campaign to save their service. We believe and are glad that for most children, in most places, most of the time, the quality of children’s heart care is very, very good. But this is not good enough. Through all our information sources, we are aware that the children’s heart care system is not always safe and it certainly isn’t sustainable. Indeed, some of CHF’s member organisations have criticised CHF for colluding with the message that the existing service is safe at the start of the Safe and Sustainable review, when clearly the service is not completely safe. Without unnecessarily alarming parents, we now act decisively when we become aware of potentially unsafe working practices within the national service. In the absence of morbidity data that enable comparisons in terms of quality of life after surgery, CHF has listened carefully to what clinicians say, usually off the record, about variance in quality across the service. Professor Sir Roger Boyle caused a sharp intake of breath when he publically stated what has often been privately reiterated – that there are children’s heart surgery units where he would not want to send a member of his family. If services are sub-standard, action must be taken to protect children. When CHF has followed through on concerns raised through triangulating information from our groups, helpline and clinicians speaking ‘off the record’, we have met with hostility and a closing of ranks by professionals. The Children’s Heart Federation (CHF), theUK’s largest children’s heart charity, is disappointed that proposed legal action could further delay vital improvements to children’s heart services. Children and families have waited too long for change and a protracted legal battle could put children’s lives at risk. We remain deeply concerned that children still do not have access to specialist staff round the clock. Larger surgical teams are needed in fewer larger centres so that more lives can be saved. CHF respects the loyalty felt by parents to the staff who care for their children, but improving the quality of the service must be the most important factor. The proposed changes are the result of a national review which has widespread parental and professional support. We would remind parents that it is intended that all hospitals currently providing specialist cardiology services will continue to do so, and therefore many families will not experience an immediate change to the clinical care of their children. Many parents across the country are wondering why the Children’s Heart Surgery Fund, which was set up to fund and support hospital equipment and research for the treatment of children with heart defects, has decided to put their resources towards legal fees rather than investing valuable funds in children’s care. CHF remains committed to supporting the implementation of service improvements as soon as possible. We don’t expect this to be easy as all change is challenging, but we firmly believe this process will lead to excellent care for all children across the country. We invite all parents to share their views with us so which we will feed them in to the implementation programme. We understand the loyalty felt by parents to individual centres and the staff who care for their children, but improving the quality of the service nationally must come first. We would remind everyone that there is widespread support from both parents and clinicians for the standards. We have therefore been saddened to see units attempting to resist change in an approach that some may view as misplaced localism. We urge everyone concerned with the care of children with heart conditions, whether it be clinician, manager, parent or politician, to pull together so that implementation can take place in a planned and timely manner. The Children’s Heart Foundation (CHF) has criticised a potential delay to the judicial review of heart unit changes, following rumours that the Save Our Surgery campaign group is planning to “deliberately” halt its challenge to further delay planned changes to children’s heart services. The Save Our Surgery campaign was set up to oppose the unit closure in Leeds and has applied for a judicial review of that decision. The Safe and Sustainable review has recommended the closure of three surgical units: in Leeds, Leicestershire and the Royal Brompton in London. A new set of quality standards requires each surgical unit to have four surgeons conducting between 400 and 500 operations per year. The conclusions have been met with severe opposition in the areas set to lose their units, and campaign groups in each area are fighting for a reversal of the decisions. Anne Keatley-Clarke, chief executive of CHF said: “Parents have contacted us concerned over suggestions that the Save Our Surgery campaign group have instructed their lawyers to delay their Judicial Review challenge to the proposed improvements and reconfiguration of children’s heart surgery. “It’s been suggested by some that they are playing politics with people’s services across the whole country. Parents are concerned and worried over the possibility of even more months of delays. “We are already seeing planning blight in services. There are serious worries over deterioration and the impact this will have to the care on offer. While uncertainty continues, much needed staff are not being recruited, investment in services is not taking place as managers wait to be certain their unit will continue to provide surgery. “No-one should be using legal challenges in this way, it is almost playing with the future of children and their parents. Of course if people want to use legitimate campaigns and legal challenges they are perfectly entitled to do so, but they should proceed with the legal challenge as they initially planned, not delay it for maximum disruption and delay to this process. In seeking to postpone a challenge until after the Independent Reconfiguration Panel reports they may be hoping to add many more months of hold-ups in a bid to stop these changes completely. “Put simply, if Save Our Surgery feel they have a strong case, they should surely want it to be heard as soon as possible. I hope they will clarify their position and guarantee that they will not cause such a delay; giving reassurance to parents up and down the country. “If these challenges are to take place, we hope that they will be conducted as quickly as possible to reduce distress and uncertainty to families and staff. Parents have been waiting for years and years for these improvements and yet again news about even more setbacks will be extremely disappointing and worrying for them”. Save our Surgery said there are misconceptions in the CHF statement, and told NHE: “Save Our Surgery is asking for a stay of proceedings in our judicial review case against the Joint Committee of Primary Care Trusts (JCPCT) whereby our legal representatives will request that the action be put on hold until after the Independent Reconfiguration Panel (IRP)’s review is complete at the end of February. This follows the Health Secretary’s decision to put the review process on hold until 28 February 2013 after Leicester’s Joint Health and Overview and Scrutiny Committee referral to the IRP. Save our Surgery had no involvement in this referral. “Save our Surgery is asking the Court to wait until the Health Secretary’s decision has been made as it is hoped the IRP will deal with the points raised by the judicial review challenge. This is the appropriate and right action to take in light of these circumstances and the fact that the Health Secretary has decided that the children’s heart surgery provision review process needs to be re-examined. “We have always made it clear that seeking a judicial review was our last resort option and we would rather avoid court action and the costs associated with it if we can. At the time that we initiated legal proceedings the IRP referral had not taken place – now that it has, we need to see what the panel decides before proceeding. The Children’s Heart Federation, the UK’s leading children’s heart charity, has today reacted to the news that the Save Our Surgery campaign group are planning to deliberately halt their own Judicial Review challenge, to intentionally further delay changes planned to children’s heart services. Anne Keatley-Clarke, Chief Executive of CHF said, “Parent’s have contacted us concerned over suggestions that the Save Our Surgery campaign group have instructed their lawyers to delay their Judicial Review challenge to the proposed improvements and reconfiguration of children’s heart surgery. It’s been suggested by some that they are playing politics with people’s services across the whole country. Parents are concerned and worried over the possibility of even more months of delays. Talking about the impact of continued delays to children’s heart services Ms Keatley-Clarke commented, “We are already seeing planning blight in services. There are serious worries over deterioration and the impact this will have to the care on offer. While uncertainty continues, much needed staff are not being recruited, investment in services is not taking place as managers wait to be certain their unit will continue to provide surgery. “Put simply, if Save Our Surgery feel they have a strong case, they should surely want it to be heard as soon as possible. I hope they will clarify their position and guarantee that they will not cause further delay; giving reassurance to parents up and down the country. The Safe and Sustainable review recommended a new set of national quality standards to ensure the highest quality of care. It included the requirement for each surgical unit to have 4 surgeons conducting between 400 and 500 operations per year, thereby ensuring the highest quality care of children needing heart surgery with around the clock care provided. CHF and the associations of medical professionals have long been calling for the introduction of the new standards of care which will result in fewer cancellations, better facilities for parents and excellent networks of care. It’s been suggested by some that they are playing politics with people’s services across the whole country. Parents are concerned and worried over the possibility of even more months of delays. Chief executive of the Children’s Heart Federation (CHF), Anne Keatley-Clarke, who has previously expressed disappointment at the delays said it was “almost playing with the future of children and their parents” by trying to delay the legal proceedings. She said: “It is not that I am against reviews, but this is probably one of the most looked-at reviews. Enough is enough; now let’s get on with it. “Parents have had to cope with many years of delays to promised improvements to care. The Associations and Royal Colleges of medical professionals, the vast majority of parents and all the national heart charities are behind the new standards of care for children with heart conditions. “After putting these plans and improvements on hold because of previous lengthy legal challenges and reviews, this further delay has meant yet more frustration and uncertainty for parents. Much needed additional investment has also been put on hold in many places due to the doubt about which units were to be chosen to continue to provide surgery. Anne Keatley-Clarke added, “Parents, charities and professionals involved all agree that the changes planned are necessary to improve the quality of care and outcomes for children. Whilst these sorts of changes are always difficult it’s essential we don’t lose this opportunity to deliver a well planned, well resourced and excellent national service for all children”. Although we understand and respect parents and clinicians loyalty to their local unit we are concerned by alarmist comments made by those fighting the changes, comments which could be described as misinformation, scaremongering and shroud-waving. Anne Keatley-Clarke, chief executive of the Children’s Heart Foundation (CHF), said in an open letter to Dr Sentamu that the charity was “concerned” at his criticisms of the NHS review. She said the changes would ensure the highest quality of care and were not “cost-cutting”, and the CHF supported the recommendations as it hoped they would “end uncertainty” over heart units. She wrote: “We feel it is beholden on influential commentators to appraise themselves of the facts before making pronouncements. “We feel your comments have unfortunately reinforced a misconception which is developing among some parents, which is that units not designated for surgery will not continue to provide… all the other heart services they currently provide. This is not the case. We are disappointed that this decision will result in further delays to the establishment of the new children’s heart care network, adding to the considerable anxiety that some families of children with a heart problem have been living under for many months now. Uncertainty about the final configuration of surgical and cardiology centres is now increasing the variation in quality of services across the network, as it prevents necessary investment and destabilises staff teams – prompting some staff to move out of posts at centres whose future is uncertain. Lack of staffing leads to increasing waiting times for vital operations – which is potentially damaging to the frail health of some of the country’s most vulnerable children. The case for change for the new heart -care network has been agreed in principle for some years – with the support not only of the member organisations of the Children’s Heart Federation but also the professional bodies of the specialities involved paediatric cardiac care. We understand the need for parents and staff at Leeds to be reassured that any changes to their service are based on the best available evidence.At the same time, we would urge everyone involved to move urgently to bring clarity about the shape of the new children’s heart care network, so that larger specialist surgical teams can come together at a smaller number of surgical centres, to ensure that both planned and emergency operations are delivered by well trained and well-rested surgeons at any time of day or night on any day of the year. We received this afternoon a statement from Leeds Children’s Hospital which we have reproduced in full below. CHF notes that there are concerns about the treatment of patients with congenital heart disease and that the Trust is taking action. The Trust has asked us to make clear, that this action is not about adverse mortality or morbidity figures, however we have serious concerns as to what else could be serious enough to warrant the Trust to ask a surgeon to stop operating. CHF has always respected the right of parents and public to support the unit at Leeds but has questioned whether the information provided to those supporters has been transparent and accurate. It is with concern that we learn that this member of the team of surgeons has for some time been subject to a specific restriction on his practice. We note from the CCAD website of the 376 operations reported only 60 were on adults. We trust that everyone affected will be given a full explanation of what has been happening and that a support line will be set up for worried parents. Yesterday the Court recognised the need for the NHS to continue its plan to improve services for children with congenital heart disease in order to ensure that services are safe and sustainable in the future, however the judge did rule that one part of the process was ‘unfair’. While CHF acknowledge the Court’s decision we are disappointed that uncertainty regarding the future of clinical services for children and young people with congenital heart disease will continue and the delay to the much needed changes. At CHF we recognise the right of parents and clinicians to support their local unit, however, we need to remember that the overwhelming majority: all the medical Royal Colleges, professional associations, NHS staff and national parent groups support the new standards upon which the changes to the existing children’s heart services are based. This is a national programme designed to improve the existing service in order to ensure that all children and young people have access to excellent services; which is not the case at the moment. As we await the final decision we are contacted by parents from across the country who are concerned with delays in the treatment and ongoing care of their heart children and fear that their children may suffer serious harm or die as a result of delays in the existing system. We urge all involved in this process to put heartchildren first and lay any vested interests aside. We call for strong leadership amongst clinicians and commissioners to ensure the earliest possible implementation of the Safe and Sustainable Standards. We would remind all who are reading this that we speak for parents across the country, many of whom rely on CHF to voice their opinions, because they do not wish to face the intimidation and harassment from some of the local groups. Children’s Heart Federation is deeply saddened by the announcement that paediatric heart surgery is being suspended at Leeds Children Hospital. Our thoughts are with the heart children and their families who have not received the quality of treatment they needed and deserved. We hope that the suspension of children’s heart surgery at Leeds Children’s Hospital will cause those involved in the delivery of that service – and all children’s heart care services throughout the UK – to refocus on the priority of providing the best possible care to children with heart problems. We had hoped that lessons would have been learnt from the suspension in 2010 of the paediatric cardiac surgical service at the John Radcliffe Hospital in Oxford – not least that a huge gap can exist between the poor quality of a service and the messages about it coming out from staff at a hospital to those who use the services. At that time, we hoped that care standards developed as part of the Safe and Sustainable process would be implemented. It is heartbreaking to see that that has not been the case. The news regarding the suspension of surgical services at Leeds is very worrying especially to the parents and children who are due to have surgery in the next few weeks. We understand that all the families affected are being contacted individually by the Trust and we hope that by now that has happened – although we realise that the timing of the decision, just before a long bank holiday, made this difficult. We have contacted Leeds Hospital Trust bout this and they have said ‘’ They have no statement or re assuring message for parents other than any family awaiting surgery will be contacted and sent to unit with capacity- they can not say where as it will depend on the case and capacity of the unit. We have explained that some parents are concerned and were told that they can’t reassure anyone but that they would be contacting everyone on waiting list so families actually affected should not have concerns. Any parent who is concerned about their child’s treatment should contact their child’s cardiologist who should be able to advise them. We are saddened that the NHS felt that they had to suspend surgery at Leeds, but recognise their right to do so. We believe that if there are concerns regarding matters that may affect the safety and care of patients, it is better to err on the side of caution and pause whilst an investigation takes place so that that everyone can be reassured that patients are safe or that appropriate action is taken to ensure that patients will be safe. We realise that for many the timing appears suspicious, however, it needs to be made clear that it came as much as a surprise to CHF as anyone else. CHF played no part in the decision. We have, over the past two years, drawn the attention of the Care Quality Commission to matters of potential concern and have sought reassurance that the practice at Leeds is safe but to date we have not been given that reassurance. Not one parent should be left after their child’s surgery or treatment thinking ‘’what if’’ but all should be certain that their child was offered that the best surgery and treatment regardless of the hospital they were treated at. CHF has become a focus for parent’s anger which has been proclaimed loudly, however it has also been a focus for both families and member groups who have had concerns about practice, but who have felt unable to express those concerns themselves and do not want to be identified. We have acted as their voice. We have always respected the right for families to hold views different to those of CHF and simply ask that that approach is reciprocated. We take concerns raised by families, member groups, clinicians and members of the public seriously and refer these issues on to the relevant organisations when appropriate. CHF believes that all voices should be heard but we are becoming increasingly concerned that some of the postings on our Facebook page amount to cyber bullying and has the effect of stifling debate and has caused numerous people to refrain from using the page for support (which is what the page is for) because of fear of attack by other users. We urge everyone to respect the views of others and consider the feelings of parents looking for support at this time – even if you don’t agree with them! CHF fully supported the decision to suspend pediatric heart surgery at Leeds General Infirmary because of safety concerns at the unit. CHF supports the aim to reinstate surgery once all concerned in the subsequent investigations are fully satisfied that it is safe to do so. We trust that the investigation has been thorough, independent and not overly hasty. We have been concerned by the confusion caused by the lack of sufficient explanation regarding the decision to suspend surgery. This has added to the worry and fear of parents whose children are being treated for congenital heart conditions at the LGI from Yorkshire and other parts of the country. We ask therefore, that clear explanations of the decisions taken be provided and full disclosure on the detail of the investigations of the last week; in order to reassure worried parents of the thoroughness of the investigations and that surgery is safe.We understand that for many people involved this is a very emotive issue and we call for all involved to respect the views of others, particularly those of parents who have been brave enough to express their concerns in public. We look forward to seeing an end to the harassment and bullying leveled at these concerned parents and for them to get the support they undoubtedly deserve. The Children’s Heart Federation welcomes the reassurance that immediate safety issues in respect of paediatric cardiac surgery have been resolved.We understand that surgery will be phased in gradually over the next month starting with the lower-risk cases. We feel that it would help many parents to have an explanation as to what this means, particularly what is regarded as a lower risk case and what will the phasing look like. We also feel that it would be helpful to have an explanation as to what has actually been happening because the tone and content of the information from NHS England is quite different to the tone and content of the information coming from the Leeds Teaching Hospital Trust. This mixed-messaging is confusing, distressing and misleading. We understand that despite surgery restarting, the review is continuing and we hope that at the end of the process there will be a clear explanation of all actions taken. A CHARITY has written to the Archbishop of York claiming he has “reinforced a misconception” by criticising an NHS review which could see children’s heart surgery stopped at a Leeds hospital. Dr John Sentamu supported the campaign for paediatric heart services to remain at Leeds General Infirmary (LGI) during a recent visit there, after the NHS Safe and Sustainable Review said care should be concentrated at fewer sites. The archbishop said it was “inconceivable” that LGI surgery could end and he did not want to see “a culture of winner-takes-all excellence”. A spokesman for the archbishop said he would respond privately to Ms Keatley-Clarke. But I will take a look tomorrow when I’m a bit less tired – I really want to know the background. I dont subscribe to this interpretation for several reasons. Firstly and most importantly, the S&S review was a purely clinical review, not involving politicians, lawyers or accountants. It was formed on the widely agreed premiss that fewer, bigger units with larger pools of surgeons are proven to have better outcomes. Leeds GI subscribed to this from day one and only started making a fuss when the unit was threatened with closure. Leeds and every other unit already send some cases to other units for specialist surgery. We are hopefully long past the mindset of small units tackling complex cases just to tick boxes – Oxford being a case in point. That was a disaster avoided – just. The reconfiguration does not save any money. It is costly to implement and no cheaper to run. The basis of the review was to make the service better. The delays put in place by legal challenges from Brompton, Leeds (and soon to follow will be Glenfield) have handed the whole process to the very people we dont want involved. It is now bogged down and we have given them the best excuse ever not to implement improvements. Jeremy Hunt is cheerfully dismantling the NHS and will happily kick S&S in to touch and give contracts to private companies instead. There is zero evidence that there is any improvement in outcomes with higher surgery numbers once you get beyond 250 or so. Fully agree with your comment on Hunt, though. By law every panel has to have unqualified members to represent patient & public views. Have added notes to prove that what I commented on was correct, please read the defamatory and intrusive remarks that have increased anxieties for families. Then tell me she reported them with benefiecence, I think not more maleficence. in the examples of the specific case files examined. .A number of very positive aspects of practice are present in the service provided by this Unit. morbidity and mortality is functional internally through audit and regular feedback systems. The report makes recommendations in a number of areas, which in the body of the report are identified as high, medium or low priority. The identification of a recommendation as high, medium or low priority should be considered by LTHT. It is noted that a number refer to overall policy and process in the hospital, whilst other refer to changes that may be specific to the Unit. that the Unit may assure itself of delivering a good patient experience. On the face of it the 3 year average does appear at odds with the individual year positions. The only explanation that would fit the discrepancy is if the 3 year value is taken from a different dataset or the label ‘3 year average’ is derived from a different methodology that we are thinking of. Without access to the underlying data and methods used, however we are left with surmise. Thank you! Would you mind if I gave you a call? Do you have a separate e-mail? The clearest way to see how the individual year plots and the 3 year average are related is to look at the position of LGI against the y-axis. The 3 year average value (about 1.5) is about what can be expected when averaging the individual year values. It is then noticeable that it is actually the alert area which has moved closer due to the fact that there are more data available over the 3 year period and therefore less uncertainty. The reason therefore that LGI has moved closer to the alert area is because they have been above average for each of the last 3 years. This isn’t making any comment on whether or not the standardisations are accurate, just that using the same methodology for the individual years and for the 3 year average could have produced these graphics. As I understand it part of the problem is that the data collected/reported by LGI is very poor quality so the worry is that the actual position is unknown. It could go in to the alarm area or, hopefully in to the safe area. Also, as relatively few cases are treated, a small number of poor outcomes will have a big statistical impact. There are also concerns about the number of complex cases that are sent to other units, further skewing the figures. To put it bluntly, if the alert level is reached on relatively simple cases, the unit is not operating well. I am extremely uncomfortable with the way the save Leeds campaign is now targeting other units and undermining the whole service. Its one thing to make a comparison, but another to put anyone down. I’m not part of the campaign, just pointing out what appear to me to be obvious problems with the process – though I definitely question the rationale for closing any of the existing centres. I have documents that show NICOR recognising ongoing problems with the quality of their data from all over the place, not just from Leeds. On top of the general issues with small data sets, if the general quality of data is bad, then none of it is any use for drawing conclusions about the future of a given unit. From the start of protest @LGI we have always stated that both Newcastle and LGI should remain open. Nobody has ever defamed any other unit, that I can think of apart from Ann Keatley-Clarke from Childrens Heart Federation of which LGI are not members. Isn’t she/CHF calling for LGI to close? The save Leeds campaign have been very accusative (generally towards the Freeman) that other units and the NHS have a hidden agenda to close them down. That does a great disservice to the many people who have worked hard to focus on the best way forward for our children. The CHF have many faults, but on this subject they have been very straight and unbiased. They strongly support the S&S, which could be said to support the ending of surgery at Leeds, but only as an improvement to the whole service. I think the whole issue of whether closing Leeds would in any way improve the service is not only not proven, but proven to be wrong. There’s no indication in any country that there’s anything to be gained by increasing surgery numbers above 250 – and Leeds is already far beyond that, as is Newcastle. Newcastle does substantially fewer ops than LEG, but supposedly has better outcomes – which in itself disproves the whole proposition that more means better. As for LGI’s accusations – what if they’re right? I came to the issue as an agnostic, but investigations have made me very suspicious that the whole thing smells wrong. How Nickynick can say she is unbiased at CHF as CEO; she sits on NICOR panel; she sits on CCAD panel and numerous other panels including one at UCL, I accept your apology.!! I dont know which Nicky you think I am. Does that have any relevance? She’s a CEO of a nationwide umbrella organisation. She sits/inputs to various bodies. Doesnt mean she favours any particular geographical area. You dont have to apologise. As far as I can see the positioning of the “average” value is correct. The problem lies in the confusing redrawing of the “funnel” with a diffreent X axis. The three LGI points appear to have 4, 4 and 7 items of data (position on the X axis). The “average” is not so much an average as a sum over three years, so has 15 data points (more “confidence”) and is correctly positioned, even if you use the top funnel graph. However, whether it is valid to use the same funnel for data over one and three year periods I’m not so sure.